In wound suturing, once the type of needle is selected in performing a surgical procedure, the type of suturing needles is most important. The factors that are considered for the selection of the needle are the size and the purpose, such as sifting through tissue or mending it straight away. For example, tapered needles are generally used inside the body. Bowels, muscles, or fascia places contain tissue that’s easily accessible and therefore pierced just as easily. Cutting needles, on the other hand, are used for very rough tissue ligaments and skin. As already noted, the appropriate size of the surgical needle is very important. 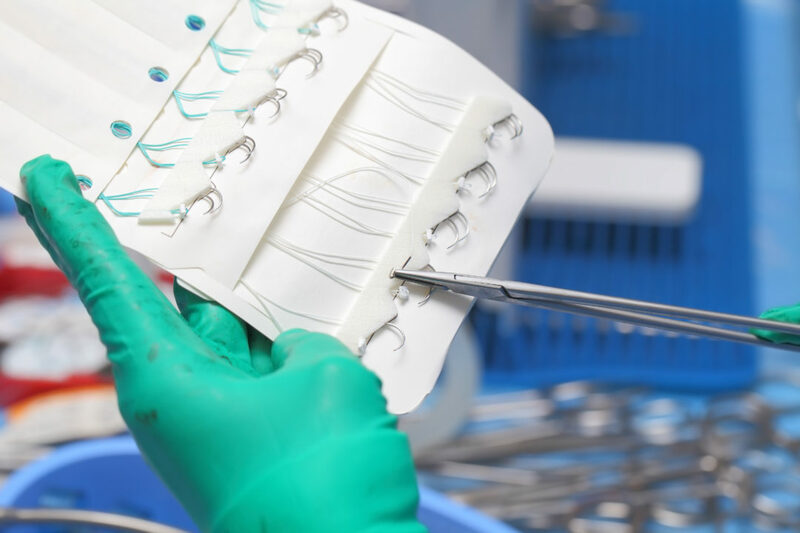 There are many different sizes and sub-types of needles that are more commonly used for performing wound suturing, and other surgical procedures. Tapered suturing needles are also called round bodied needles due to their shape and blunt point. Each one is tapered and doesn’t have a cutting edge; therefore, they are generally used for closing soft tissue such as gastrointestinal, vascular, fascia, and other soft tissue found below the skin’s surface. This type of needle is specially designed for separating tissue fibers rather than cutting them. After inserting the needle, the tissue closes tightly around the suture material, which in turn forms a sort of leak-proof barrier which prevents outside contaminants from entering the wound. Different wire diameters are used in every round-bodied needle that is manufactured. Each is made according to the type of tissue and wound to be sutured. For example, fine wire diameters are used to repair bowel tissues, whereas a heavier wire diameter is used for suturing muscle. TP (trigger point): Used to close fascia during abdominal surgery. CT (circle taper): Used to close the joint space or deep layers of tissue after general surgery. CT2 (smaller than CT): Often used on closing of uterus. SH (small half circle): Used to close bowel or tissue layers after breast surgery. CV: Used for nerve repair and delicate vessels. These types of suturing needles are used for general closure of skin, subcutaneous tissue, etc, and are sometimes used for ophthalmic and plastic surgery. The point of the needle is triangular and contains a cutting edge. Other than the conventional cutting needle, most surgeons prefer its sub-type, the reverse cutting needle, except when working with tough tissue. The difference between the two is the cutting edge. The edge of a conventional needle is on the inner curvature. The edge of a reverse cutting needle is located on the outer curvature. FSLX (for skin/FS extra large): Used for large skin closure, when a lot of tension is present. FSL (for skin large): Used for the procedures that need a higher tension closure. FS2 (smaller than FS1): Used for common closing of skin. P3: Used for closing of small incisions, such as in facial reconstructive surgery and hand surgery. Learn suturing techniques as part of your medical education, or even personal preparation should you run across an emergency and get to medical personnel. 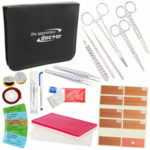 You can use The Apprentice Doctor’s Deluxe Suture Kit & Online Training Course in the privacy of your own home. Practice using high quality suturing instruments on a silicone suture skin model. It’s the ideal kit for student doctors, nurses, and survivalists and preppers. What is the difference between a Reverse Cutting Needle and a Curved Cutting Needle? The cutting (sharp) side of the needle is on the ‘back’ side of the curve with reverse cutting and on the ‘inside’ of the curve with a regular cutting needle. I’m glad you pointed out that tapered surgical needles are generally used inside the body. It makes sense that tapered needles would be a good fit for an area that’s easy to access and pierce. I learned a lot of interested things about surgical needles, so thanks for sharing this info!